Go into a course as an editing teacher or site administrator. 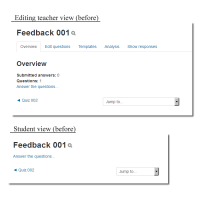 Create a Feedback instance with some questions over multiple pages. Go into the course as a student. 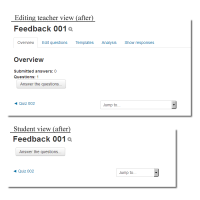 Click the Feedback name on the course. Click "Answer the questions" button. Now we have a navigation link (e.g. "Quiz 002" on attachment: before.png) under "Answer the questions..." link. And sometime it's not easy to find the right link to click for answering questions. So I'd like to suggest to use the "Answer the questions ..." button instead of "Answer the questions ..." link to improve the visibility (attachment: after.png). Please refer to the lines below to modify Feedback module code. // Feedback was already submitted. // Fixed by Ryan's suggestion.